I have spent my life public service and public policy fighting for conservative ideals. Limited government, free-market policies, traditional values, American exceptionalism – these are the issues that gave rise to the Reagan Revolution and the modern day Republican Party. Over the past 30-plus years since Ronald Reagan urged America to partake in a “rendezvous with destiny,” these principles have come under attack – not just from the liberals, but from within our own party. We have watched Republicans talk about reining in government on the campaign trail, only to become part of the problem the minute they are sworn into Congress. The West Virginia Senate race is a microcosm of the battle for the heart of the Republican Party. With West Virginia trending deep red (Trump won the state with 67 percent of the vote), Democratic Sen. Joe Manchin is one of the most vulnerable Democrats this cycle. The million-dollar question is: What kind of Republican will win the right to challenge him? For genuine conservatives who are sick of you-scratch-my-back-I’ll-scratch-yours politics in Washington, there is only one choice: Attorney General Patrick Morrisey. Patrick Morrisey grew up in a working-class family, the son of a World War II veteran and a Veterans Administration nurse. Like so many other conservative, Morrisey came of age politically during the Reagan Revolution. In high school debates, Morrisey was always chosen to play Reagan while his classmates played Walter Mondale. Patrick took whatever odd jobs he could find to pay his way through college and law school – stock boy at CVS, tennis tutor, athletic referee, pool digger. This steely determination would later make him on of the most aggressive attorneys general in the country and President Obama’s worst nightmare. After moving to West Virginia in 2006, Morrisey ran for attorney general in 2012 against a five-term Democratic incumbent. He became West Virginia’s first Republican attorney general since 1933. Then, Patrick went to work. Morrisey successfully sued President Obama multiple times. Most famously, he led a 27-state coalition against Obama’s “Clean Power Plan” all the way to the Supreme Court. Patrick also led a nine-state coalition against the EPA’s “waters of the U.S. rule,” which regulate small bodies of water (liked ditches and dry creek beds) under the Clean Water Act. Obama’s executive amnesty and Obamacare were also targets of Morrisey’s conservative crusade. On traditional red meat issues, Morrisey is just as reliable. As attorney general, he conducted a comprehensive review of West Virginia’s abortion laws that led to the passage of the state’s Pain-Capable law. He also expanded West Virginia’s reciprocity rights for gun owners with 16 states. A genuine fiscal conservative, Morrisey did something practically unheard of in today’s political world: He has voluntarily returned more than $40 million to the state’s general fund. He also went after waste and fraud with a laser focus, saving taxpayers millions of dollars. Finally, Morrisey has been a warrior on what is arguably West Virginia’s most pressing issue: An opioid crisis that has claimed thousands of lives in the Mountain State. Morrisey launched the state’s first unit targeting substance abuse, created educational programs statewide, and initiated a faith-based unit to combat drug use. On the other side of the Republican primary, you have Evan Jenkins, the longtime Democrat-turned-Republican congressman from West Virginia’s Third Congressional District. As a state legislator for nearly 20 years, Jenkins was a reliable Democrat, supporting cap-and-trade, Obamacare-type legislation, gun control, and tax increases. His political career is littered with contributions to fellow Democrats including to the very Democrat he is now trying to unseat – Senator Joe Manchin. Manchin even supported Hillary Clinton in 2008. Jenkins climbed the ranks from the House of Delegates to state Senate. In 2013, he saw the writing on the political wall. He switched parties and announced he was challenging Democrat Rep. Nick Rahall in the third district – who he had also once donated to. The differences between these two candidates are stark. They both have long, consistent records. We don’t have to guess as to what kind of senator either one will be. 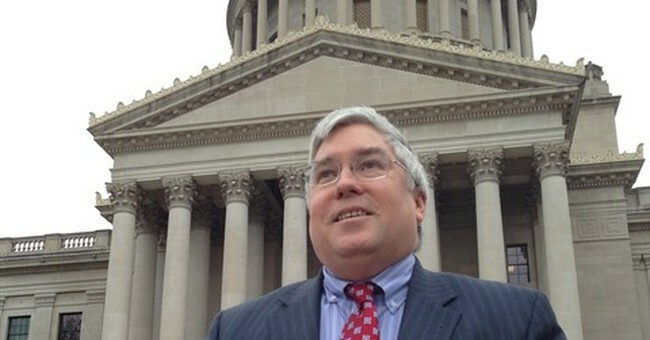 Attorney General Patrick Morrisey has been a conservative since his early teenage years. As attorney general, he has fought for the little guy against big corporations and an increasingly powerful federal government. He will be the kind of senator that goes to bat for gun rights, that protects West Virginia coal jobs, that stands up and fights when Washington tries to push through yet another bloated government program on the backs of taxpayers. Evan Jenkins is a liberal Republican/former-Democrat who will do what he needs to do to stay in power. A go-along-to-get-along politician, he is the consummate backbencher. He will not be on the front lines of any major fight – certainly not if it will anger the people in charge. The choice is clear; the choice is obvious. Republicans need to rally behind Patrick Morrisey in West Virginia.